After Kashgar and the Karakoram Highway, we continue on our exploration of the Xinjiang Uyghur province and travel 500km South East from Kashgar to Hotan, following the Southern Silk Road. For this 8 hour-trip you have the choice between bus or shared taxi. 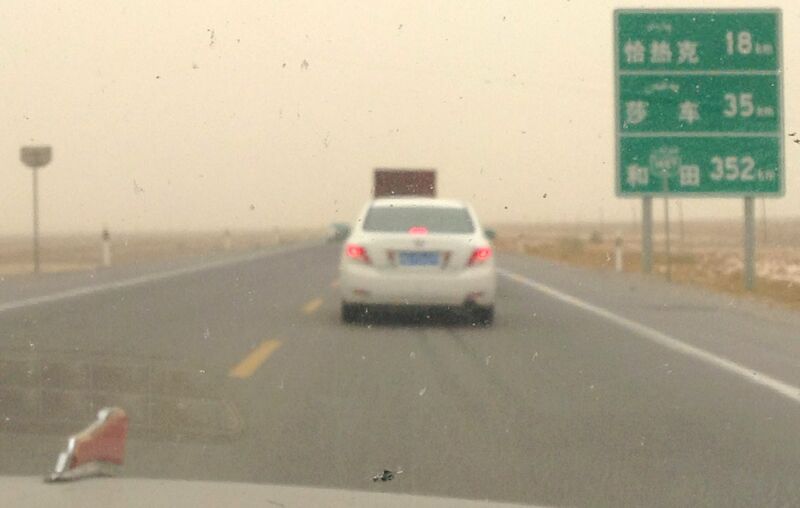 I decided to go for the ‘Travelling like a Boss’ option and chose to undergo the desertic journey in a FAW Hongqi! Hongqi (pronounced Hongchee) is the luxury Chinese brand by excellence and is the official supplier of parade cars for the Chinese government. I have written how impressed I was by the Hongqi stand at the Beijing Auto Show here. Now I wish I could say I travelled on the all-new $800,000 L5, but I am not that big a Boss yet. 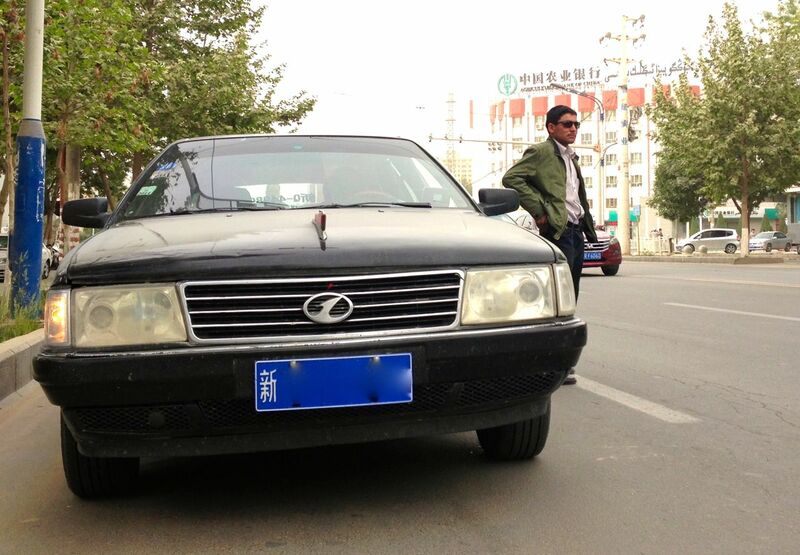 Nope, it was simply 1997 Hongqi CA7200, which is in fact none other than a 1982 Audi 100. As long as the red diamond was standing on the bonnet, I was happy. Flying in the face of all the reported tensions between the Muslim Uyghur population and the Chinese Han, our Hongqi was a microcosm of society and a very happy one indeed. Our driver Mulat was Uyghur but spoke both Uyghur and Chinese, and was very curious to observe my passport at one of the two check points we went through during the trip. Red Hongqi diamond on the bonnet: tick. 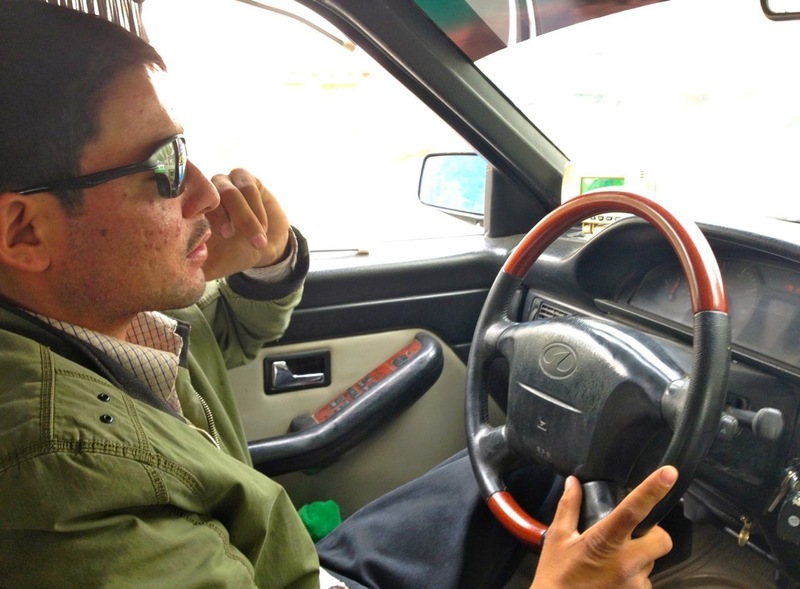 The four passengers – the car wouldn’t leave until full which meant we waited 1h30 before being able to take off – were split this way: one Chinese young lady, a Uyghur father and son both wearing traditional hats, and myself. No English was ever spoken during the 8-hour trip, meaning my sign language skills were tested to their full extent! When the Uyghur father learnt I was French he looked mesmerised at first, then very proud I would be travelling with him and so surprised he couldn’t stop repeating the words ‘Faransiya’, Uyghur for ‘France’. The Chinese lady spoke a bit of Uyghur and vice-versa for the father and son couple speaking a bit of Chinese, and with our driver being multi-lingual, for almost the entirety of the trip our Hongqi was the theatre of many happy conversations. Living this slice of life in remote China that you understand that when it comes to it, everyone just wants to get along. As for the cars spotted on the way, there weren’t that many to be honest, and travelling on the only highway in the province with numerous tolls along the way, the car landscape was not in any way representative of what sells best in the region, so I will update you on the car landscape in the next city which is Hotan on the Southern Silk Road. I promise for the next article I will publish a map of the province to show you where the heck I am! Ahahah the songs on the videos are so funny, i love to know better this part of Asia, you have the best job in the World, continuation of good trip! Thank you very much! More Photo Reports on this part of China will come very shortly.